Europe Inland Waterways Vessel Market size was worth over USD 55.85 billion in 2016 and is estimated to reach USD 115 billion by 2024 at over 9% CAGR from 2017 to 2024. 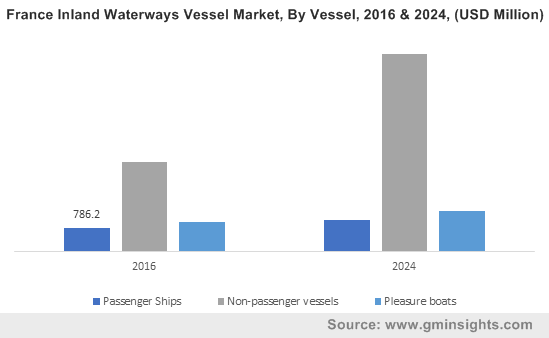 Increasing marine passenger traffic and goods transportation will drive the Europe inland waterways vessel market share during the forecast period. EU constantly working on improving legislation to adopt a uniform set of technical standards for inland navigations vessels which in turn support the industry growth. In June 2016, European Council formally adopted revised directive to set the technical requirements for inland waterways vessels operations. The Central Commission for Navigation of Rhine (CCNR) in partnership with European Commission develop and monitor regulations for waterway transportation. The organization is engaged in various activities related to transport on rhine such as developing regulations ensuring the river environment, provides information services to support traffic & transport management in inland navigation. Increasing consumer preference for pleasure boats will support the industry growth during the forecast period. Boating industry is competitive and significant contributor to the regional growth. Europe recreational marine activities is stimulated by 27,000 km of inland waterways and more than 70,000 km of coastline and from international tourists. Recovering economies in the region and increasing travel & tourism across the globe is expected to increase the demand for Europe inland waterways vessel market share. However, cost associated with upgrading the existing fleet, new vessel construction and uncertain economic condition in the region will hamper the industry growth during the forecast period. Non-passenger vessel accounted for more than 60% of the total revenue in 2016. The growth is attributed to increasing demand from freight vessels for goods transportation. The segment is expected to exhibit highest CAGR owing to its superiority and efficiency in goods transportation compared to road and rail transportation mode. The energy consumption per km/ton of good transported by waterways is approximately 50% as compared to rail transport and 17% of road transport. Moreover, high degree of safety for transporting dangerous goods and reducing road network congestion in highly dense areas will support the adoption of waterways for non-passenger vessels during the forecast period. Increasing usage of motor cruiser, sailing cruiser and houseboats will drive the revenue from pleasure boat segment. The revenue from this segment crossed USD 11 billion in 2016. Increasing demand from river cruises supports the industry growth. In 2015, number of people undertaking a cruise on European river increased from 1.13 million to 1.33 million with nearly 17% of increase in one year. Amsterdam is the most important point of departure for river journeys. Increasing new construction rate from river cruise sector is the prominent trend in European passenger vessel segment. In 2015, 30 new river cruise vessels were added in European market which contributed to nearly 10% of the existing river cruise ship fleet in the year. Heavy fuel oil (HFO) segment valued for USD 40 billion in 2016. LNG is expected to exhibit highest CAGR compared to other fuel alternatives owing to its increasing usage by the fleet owners. Increasing usage of LNG in smaller vessels for short sea and/or inland waterways by number of companies in Europe will boost demand during forecast period. The growth is supported by legislations by EU regarding technical requirements of inland navigation vessels and stage V emission limits & type approval for internal combustion engines for non-road mobile machinery. Low sulphur fuel oil (LSFO) growth is affected by EU legislation to limit the sulphur content in liquid fuels. From 2016, member states in EU are asked to ensure sulphur contain in fuel ships should not exceed 0.1% in Baltic Sea and North Sea including the English Channel. Netherlands, Germany, France and Belgium are major contributing countries for Europe inland waterway vessels market share. These countries contribute over 50% of the total industry share in 2016. Rhine is the main river in Europe’s inland waterway transport industry contributing to 2/3 of the total volume transportation in Europe. Rhine is the part of the Rhine-Alps corridor which covers Netherlands, Italy, Germany Switzerland and France making these countries important for overall revenue generation in the region. Growth in Germany and Netherlands is attributed to increasing revenue from metal ores and other mining products. Moreover, established travel & tourism industry in European countries and increasing number of foreign tourist preferring waterways will boost the industry demand. 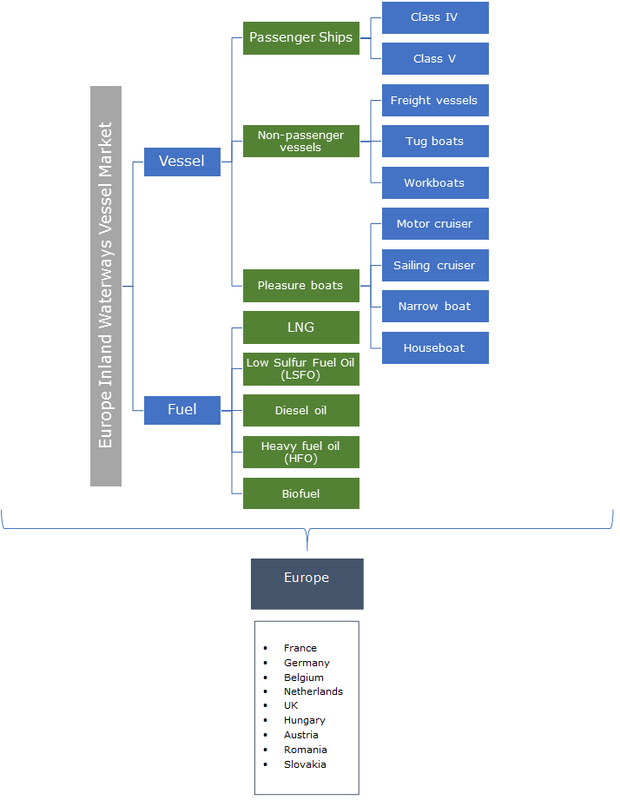 Europe inland waterways vessel market participants are Viking Line, Rhenus Group, Mediterranean Shipping Company S A, Construction Navale Bordeaux, MEYER WERFT GmbH & Co., KG, Bayliner, European Cruise Service, and Euro RIJN B,V. Stringent regulatory norms to be complies further intensifies the competition among the service providers. Companies are engaged in M&A activities for their product growth and regional expansion. Manufacturers and service providers focus on modernizing fleet, increasing capacity and customer satisfaction to gain the market share. Maintaining close contacts with shipping companies across the region helps the companies to sustain their business in highly competitive industry. Inland waterways transport is an important industry contributing to growth of goods transport through waterways in Europe. Europe has more than 37,000 km of waterways which is used to connect industrial regions and transport goods. 21 states out of total 28 EU members have inland waterways with 13 states interconnected with waterways network. The industry possesses high growth potential owing its simplified transportation compared to other modes of transportation. The industry growth is supported by reliability, major capacity for exploitation and energy efficiency. Inland waterways transport in Europe is competitive alternative to rail & raod transport as it offers eco-friendly alternative in terms of noise emissions and energy consumption.